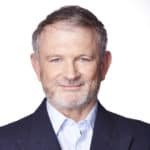 The Blue Mountain region boasts spectacular views yet, as Bernard O’Shea finds, its highest scenic lookout is strangely little known. Every day buses whisk hordes of tourists off to the Blue Mountains on Sydney’s western fringe for a quick runaround of the main attractions – Evans Lookout, Wentworth Falls, Katoomba Falls, the famous Three Sisters, some shopping in the picturesque village of Leura, and then off to Scenic World to ride on the railway, skyway or cableway. If there is any time left to spare, they might pop in at the Hydro Majestic Hotel in Medlow Bath for a peep at the lovely Megalong Valley (megalong being an apt description). It’s brisk and efficient. Time-poor people can boast, “Been there, done that; another World Heritage site ticked off the list”. Which is a pity, because the Greater Blue Mountains World Heritage Area is massive (1.03 million hectares, including seven national parks) and the region warrants so much more scrutiny and measured appreciation. If you want to get a sense of the beauty and serenity of the mountains while steering well away from the madding crowds, there is a great spot that few people know about – Hassans Walls Reserve, just south of Lithgow (which itself is an underrated township tucked in snugly under the mountains). The Reserve comprises more than 770 hectares and is notable for its lookout and stunning “pagoda rock formations” – limestone cliffs that have been sculpted by erosion. 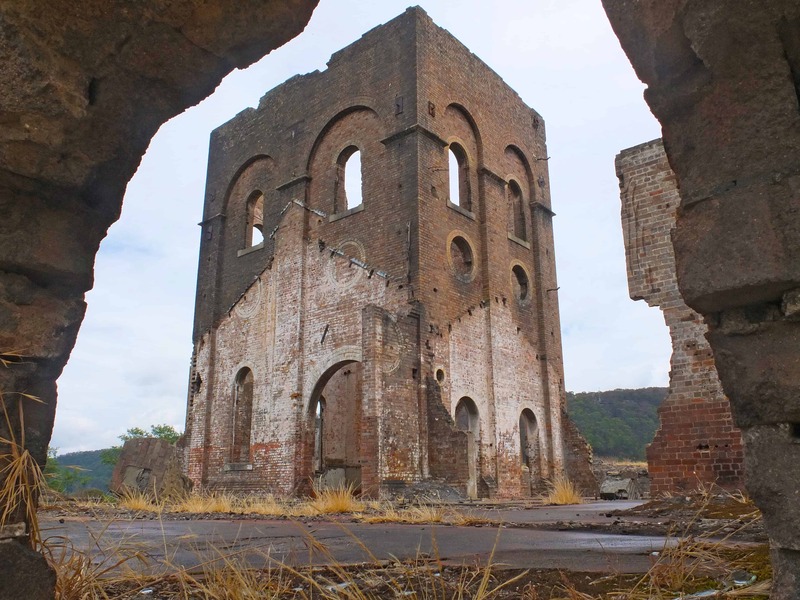 The ruins of the Blast Furnace at Lithgow. 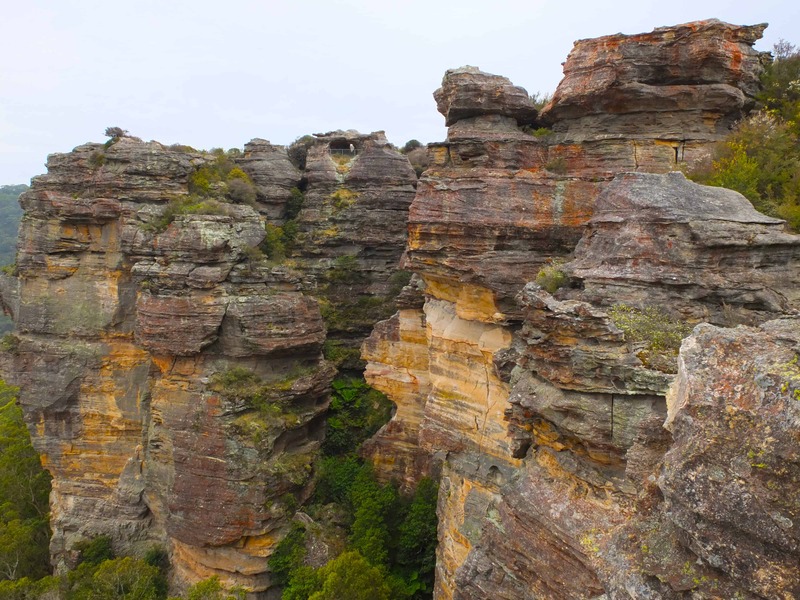 Hassans Walls Lookout has one notable claim to fame – it’s the highest scenic lookout in the Blue Mountains, at about 1130 metres above sea level, and it has great 180-degree views over the Hartley Valley of the splendid Blue Mountains escarpment. It is easily reached by road, and a boardwalk installed in late 2014 offers comfortable pedestrian and viewing access. You don’t have to be fit and athletic to visit it (I’m living proof of that! ), yet when I was there with relatives we more or less had the whole place to ourselves, and were grateful for it. Bernard O’Shea travelled to Lithgow at his own expense. Photos © Bernard O’Shea.